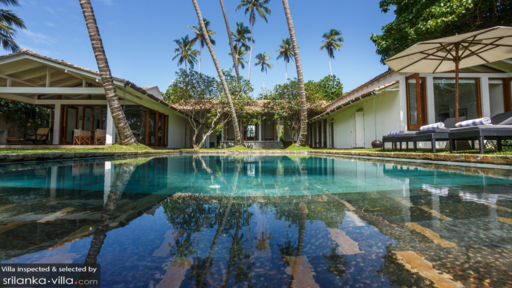 A stunning location, Galle, is an equally stunning private villa, Villa Victoria, a five-bedroom tropical paradise with expansive spaces, towering coconut trees, and a remarkable view of the Indian ocean. Kids can play around on the manicured gardens, as you lounge beside the pool all day with a drink in hand, or lounge in the media room while you watch movies with your friends and family. With lavish massages and a panoramic vista will put your mind at ease and lift your spirits a thousand times over. If it’s a good night’s sleep you ardently wish for, then the master bedroom with a weathered, four-poster, canopied double bed, white interiors, a built-in cushioned window seat, and a spacious layout is just what you need. Quality, aquamarine bedding adds a calming touch to the room and the soft lighting works as a sleeping balm, no less. A quaint dressing area and ample wardrobe space are also found in the room. An en-suite bathroom with a freestanding bathtub and walk-in tropical shower is also available to guests. Besides the master suite, there are four bedrooms, three with double beds and one with twin beds. Each bedroom has four-poster beds, with sheer-white drapes billowing in the fresh, island breeze from the large glass windows. The air-conditioned bedrooms come with en-suite bathrooms for your comfort. A sprawling manicured lawn is the perfect setup for an impromptu BBQ while gazing at the mesmerizing view of the Indian Ocean. A greenstone-tiled swimming pool with granite steps is an inviting and beguiling sight drawing you in to dive in and enjoy a refreshing dip or a few laps in its crisp, cool waters. Palm trees fringing the periphery and with the sunset upon you, a breathtaking experience awaits you at Villa Victoria. Galle’s beauty and tranquility will be the cherry on top of your perfect tropical holiday. Relax on the sun loungers and take a lofty nap under the shade of large parasols. Villa Victoria celebrates island living with calming colors, restful spaces, and comfortable interiors to make you feel at home and at ease. A traditional, high-vaulted ceiling painted white, similar to the walls, and the floors graced with jute, natural fiber, carpets gives the living area a charming ambiance. 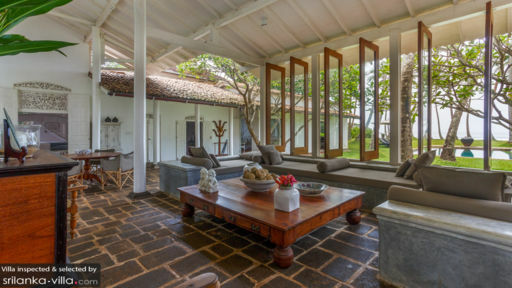 A garden pavilion with swivel windows on an entire wall, is comfortably furnished with cushioned stone seats and a large coffee table in the center. The villa has a lounge area with a TV and a collection of DVDs for guests to unwind with fun movies to watch with friends and family. Guests have the liberty to choose their dining spots anywhere in the villa, whether it’s beside the sea, or on the verandah, or on the dining table in the living room. As per your mood of the day, you can enjoy a luxurious and a soothing dining experience wherever you wish. While the house chef delights you with cuisines from around the world, relish the laidback atmosphere here at Villa Victoria. The best part for pizza lovers, that is everyone in the world, the villa offers a state-of-the-art cinnamon wood-fire pizza oven, for the best pies you will ever eat! The excellent staff at Villa Victoria is revered for their hospitality, warmth, and smiles. They will make sure that your stay is memorable and cherished. The chef is ready to serve an array of expert dishes and the staff is ready to help you if you require anything. Galle is a UNESCO World Heritage Site with streets lined with colonial bungalows, colonnade, mansions, and museums. The famous fort in Galle is a must-visit, well-preserved and built starting from 1663. This historical city is suitable for an enchanting, tropical getaway with family and friends. Many restaurants and shops can be found near the villa if you wish to try out some of the local food. We stayed at Villa Victoria for the first time in March 2019 and cannot wait to return. In fact, we wish we don't have to leave! Thanks very much to the wonderful staff who took such good care at us, had such happy smiles. Thank you too for the incredible food. The meals were each very delicious. 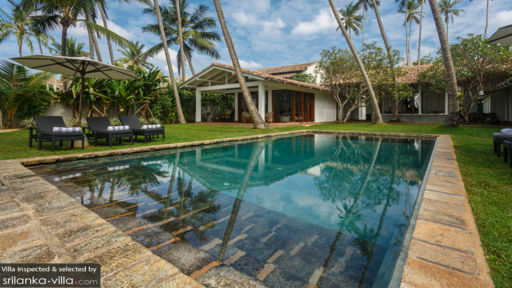 We would recommend Villa Victoria to anyone traveling to Sri Lanka. Just a note to say thank you for such a wonderful weekend - we absolutely loved it all! Anil and his team could not have been kinder or more helpful, and also very accommodating with all with our wedding comings and goings. Every meal was delicious and the villa itself was stunning - all in all we were very sad to leave. We will forever remember our glorious stay. The food has amazing! Every meal has been beautifully presented and tasted just as good. The villa and the rooms have always been immaculate and the gardens perfectly manicured with not a leaf out of place. The security guard has been diligent and kept us safe. Thanks to all for your care. Great start to our Sri Lankan adventure. Thank you for welcoming us all and making everyone feel so happy and relaxed. This was a very memorable holiday and we enjoyed ourselves to the max! What a magical place! We can't wait to return. The food was Amazing! Thank you for your hospitality and warmth. What a great team! The food was fabulous and special thanks to the genuine care for the children! Will miss you all! Victoria has been home away from home : it's a wonderful villa. We knew getting villa for New Years would be hard. Little did we realise that, we would be this lucky. Even before we got here, Owners made us feel like we were only going to our home in another country. everything was taken care of. Anil is the best cook ever! Hospitality at its best up to coming back for sure! Many thanks to Anil and his team. You made Victoria our home with your warm and generous hospitality. Always smiling, always laughter, always there to help! Delicious food too!! Special mention Billy the dog, ready to welcome us home every night with a howling hello! We loved every minute.